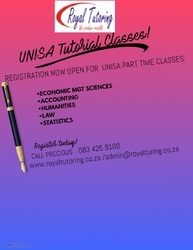 Royal Tutoring is an innovative and modern provider of tutoring. It specializes in the provision of group classes and one on one tutoring (extra lessons) for all school and University subjects e.g. UNISA, MANCOSA. Tuition can be done in your home, at your workplace or at any one of our venue centres. We have professional tutors prepared to offer you the best quality tuition.